The Netherlands also was known as Holland is located in Northwest Europe. One of the best places in the world to study, Netherlands has, in particular, created a name for itself in the fields of Engineering and Technology. It attracts student from all around the world to pursue Undergraduate, Graduate and Doctorate studies. The Universities in the Netherlands are known for their renowned faculty who are perfectionists in their field of expertise. Learning from such faculty will allow you to gain both the theoretical and practical knowledge you require to succeed in the workplace. The Dutch system of learning is interactive, based on applying practical knowledge to solve problems. This system of education is achieved through a well-planned system of training and quality assurance. This system is created with the industry in mind, so when you take up a job, you will find the working similar and easy to pick up. Even if your primary interest is research, the Netherlands has many research laboratories with world-renowned professors, laboratories where cutting-edge research is the norm. Thanks to the large-scale collaborations with top companies and research organizations, finding a job in the country is relatively easy. A well known University in Delft, Netherlands, this College is the prehistoric home for Engineering and Technology. Founded in 1842, the University's logo shows off a flame referring to the flame carried by Prometheus, the first Engineer. TU Delft is made up of 8 different Institutes including Civil Engineering Institute, Electrical Engineering Institute, etc. known for their exceptional Bachelor's, Master's and Doctorate degrees. There are 14+ different B.Sc Programs in which the students proudly receive their degree after a three year study period and around 40 M.Sc programs, each of which spans a two year period. The Faculties are experts in their fields and play an important role in guiding and mentoring the students. TU Delft is famous for its Research Institutes that include Netherlands Institute of Metals Research, Delft Center for Engineering Design, etc. and are envious precursors of various projects namely Superbus and Open Design Concept. For courses in English you will need TOEFL (90+ or IELTS 6.5+). This University is located in Eindhoven, Netherlands and is the Second Best University for Engineering after the Delft University of Technology. It has been ranked 61st globally for Engineering studies with the exclusive aim of providing exceptional quality education and knowledge within the Engineering domain. Known for its Research in the Automobile division, this University houses 9 Departments skilled in offering various degree programs. The Bachelor's program serves as a stratum for higher education by taking the student on a basic journey through the Engineering world. The Master's and the Doctorate programs mete out A-1 education that will develop the elementary expertise possessed by a student for a productive career. This University stands among the top 10 Universities in the world for it Research facilities and is well reputed for its Institutes including Netherlands Organization for Applied Science Research, Institute for Biomedical Engineering Science and Technology, etc. the University of Twente is located in Enschede, Netherlands and works together with the The Delft University of Technology and the Eindhoven University of Technology under the cap of the 3TU.Federation. The University is top-notch for Engineering and Life Sciences and promises a large number of Bachelor's degrees and a limited number of Master's and Doctoral programs. The programs have been designed in a way to create opportunities for skill development. Research is a prominent feature of the University of Institutes including Center for Telematics and Information Technology, MESA+ Institute for Nanotechnology, etc. One of the largest research Universities in Europe (with around 32,000 students). There are around 5,000 international students. Highly recommended Software Engineering program with focus on research. 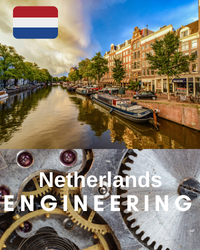 The Netherlands forms the hub of Engineering in Europe. Due to the ample job opportunities and low fees factor, it is a natural choice for engineering related studies.